#1 on Product Hunt. 1 year later. Chris Turner and I are the co-founders of a startup called Tenrocket, which we started about 2 1/2 years ago. We build web and mobile apps for startups in 10 days for 10k, and we’ve launched close to 40 startups since opening our doors in 2014. Last year around this time in October, we were putting the finishing touches on our new website, which was part of a larger effort to rebrand Tenrocket and reach a larger audience outside of our home city in Atlanta. Part of that strategy was to be featured on Product Hunt. That goal sounded lofty at the time, but sure enough, we hit #1 on November 1, 2015. We thought it might be fun to share the backstory behind our launch, how it all went down, and the aftermath of reaching #1 on Product Hunt. Our goal is to give you a rare peak behind the curtain, along with some helpful takeaways you can use when planning your own launch. About three months before launch, we were reading the book Traction by Justin Mares and Gabriel Weinberg. At its core, Traction helps entrepreneurs make sense of the ocean of marketing channels available to them, narrow their focus, and ultimately choose three. You then run tests on each of those channels, measure the results, and pursue the one that works the best. They call this the Bullseye Framework, and it’s one of the most actionable tools I’ve encountered in startup literature. Takeaway #1: Understand and test your traction channels. At Tenrocket, we decided that PR was worth exploring. After researching hundreds of publishers, Product Hunt stood out in our mind as a perfect fit. Not only was it a like-minded community of entrepreneurs and creatives, but we also had the opportunity to speak directly with people interested in our product. 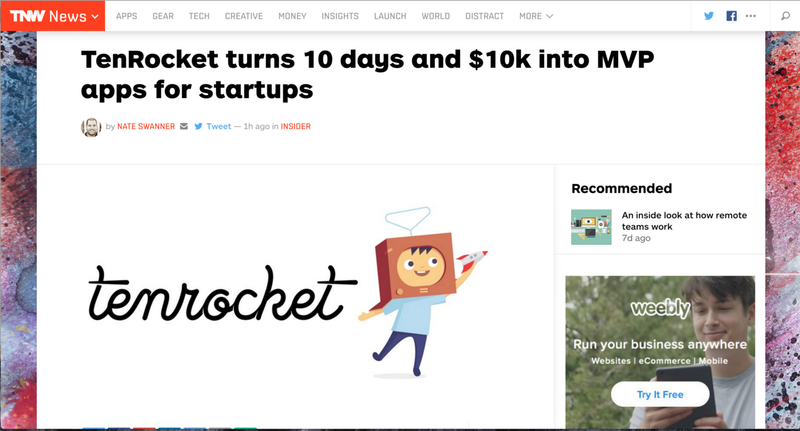 Since many Product Hunters are working to build a startup themselves, we thought they might benefit from hearing about Tenrocket. After all, launching quickly without sacrificing quality is our sweet spot. To reach some of the other publications we selected, we hired the amazing folks at PressFriendly. For two guys who had no idea about the world of PR, they were a godsend. In addition to giving us access to a comprehensive database of bloggers and authors in our market, they helped us craft a strategy and press release worthy of attention. If you are considering PR as primary channel in your growth strategy, I would highly recommend PressFriendly. After about a month of prep work, we reached out to several journalists and got picked up by The Next Web. So cool! The article was published on The Next Web on October 30th, 2015, and thanks to this fine gentleman, it got hunted on Product Hunt just two days later. Our plan was to launch Monday on Product Hunt, but we got beat to the punch! Takeaway #2: Don’t expect big things to happen without work. Even though we planned for this, we we’re quite unsure what the response would be. Would people like us? Would they believe we were capable of building something of high quality in 10 days? How do votes work on Product Hunt again? Looking back, we admit there was a bit of controlled luck at play. We did our best to plan and execute our strategy, but the rest was left up to the internet gods. As much as I’d love to think the reception was due to our awesome product, countless amazing products launch all the time that don’t get seen or funded. Not everyone can expect the success of Exploding Kittens (the most funded Kickstarter game of all time) or Polymail (the most up-voted on Product Hunt of all time), but we were humbled to be featured nonetheless. It was a whirlwind Sunday spent responding to questions and thanking people for votes, but by late afternoon we had blown past 400 votes. Amazing! The best part was feeling we had struck a chord in the startup community. We were overjoyed that people bought into our mission of taking their biggest dream and ‘making it real’. What previously felt like a secret was now out in the world, and people actually liked it. Our joy was quickly overshadowed by the question of how to fulfill the sudden influx in demand. There were a ton of leads pouring through to our new site, and we had zero data to determine how many would turn into actual paid projects. The upturn in clients could mean we’d be running out of resources very quickly. Oh my. After the excitement from the initial launch wore off, we quickly found our stride in managing the projects that were coming in. Though it was stressful, scary, amazingly fun, and emotionally draining, the launch was instrumental in exploiting the flaws in our system, improving core processes, and helping us grow. Aside from the aforementioned luck and a little love from the startup community, we stood out because we chose a position. We know who we are. We know what we care about. We love helping entrepreneurs launch amazing products. We love getting into the weeds and helping them craft and hone their ideas. Most of all, we love taking those ideas and making them real as quickly and affordably as possible. Everything else is kicked to the curb. If a project doesn’t fit our model or values, we’re ok with not taking it. It’s not easy to turn away business, especially when there are large sums of cash on the table, but ultimately it helps us craft a simple and specific message. One that breaks through the clutter of “we’ll build anything” agencies and draws a line in the sand. Takeaway #3: Be willing to lose clients who don’t align with your values. At the end of the day, people prefer clarity over ambiguity. Fewer options over many. Chipotle offers a perfect example. In a world of “have it your way” restaurants, Chipotle says “We only have a few things. Pick one and it will be freaking amazing.” Like Chipotle, early-stage startups should pick a beachhead and fight tooth and nail for it. In our experience, you’ll gain superfans who believe what you believe and are excited to spread your message to others. Takeaway #4: Focus trumps generality any day. These are not necessarily polar opposites in the startup universe, but it certainly felt like it in our case. Our success on Product Hunt gave us an opportunity to build a growth machine, increase leads, double exposure, and continue to ride the exponential growth curve. We pressed into this a bit, but quickly realized we we’re neglecting the very reasons we started Tenrocket in the first place. Even though we had an opportunity to take investment, scale quickly, and become a super-efficient connection machine, that model was at odds with what we cared about the most: helping entrepreneurs launch amazing products and businesses. What we were gained in efficiency was lost in effectiveness. It wasn’t just about building something. Any software agency could do that. For us, we cared about working one-on-one with each entrepreneur, helping them think through their business idea, craft a path forward, and execute. That’s where our heart led us. Takeaway #5: Don’t lose your heart for the sake of growth. Following heart over money is a challenge for any entrepreneur, but it’s an important one to consider. You may spend a good portion of your life working on your company, so you better enjoy the ride. It’s easy to feel pressured when VC’s and Silicon Valley as a whole push you to become the biggest and the baddest, but if you take time to ponder what’s actually important to you, you might find it’s important to others as well. We’ve learned a ton since our launch, and I hope that our story is helpful in your efforts to build something that matters. Working on a startup can feel lonely at times, but occasionally we’re reminded of how large our community truly is. Many of you went out of your way to upvote Tenrocket and share our launch with others, and we sincerely hope to return the favor. Many thanks to Product Hunt, PressFriendly, and all the brave souls who forgo comfort and safety for the sake of adding value for others. Don’t expect big things to happen without work. Be willing to lose clients who don’t align with your values. Focus trumps generality any day. Don’t lose your heart for the sake of growth.